From left: Suzanne Kuwano, Jean Shikata, Lina Yamaguchi and Kazie Kame show off some of the bazaar’s delicious Asian cuisine. 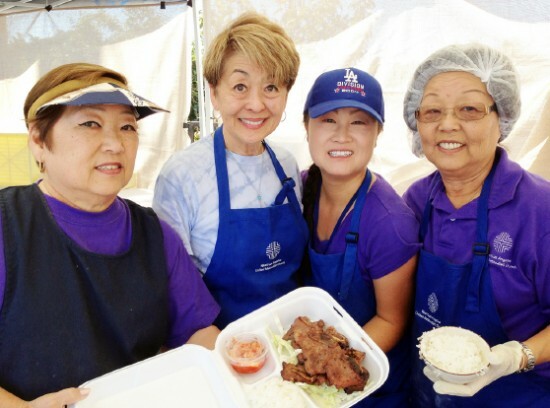 Since 1952, West L.A. United Methodist Church has hosted an Asian Cultural Bazaar, featuring Asian cuisine, entertainment, and cultural presentations. This year’s celebration will be even more memorable as it marks the 85th anniversary of West LA UMC’s life as a vibrant community of faith. In addition to the silent auction, attendees can purchase garden plants, fresh baked goods, and gently used items from the Second Chance Store. Everyone will enjoy live entertainment throughout the day, including taiko drumming, hula, contemporary folk, and rock music. Children will have fun with games, crafts, and face-painting. The West L.A. UMC Asian Cultural Bazaar will be held on Saturday, Sept. 19, from 11 a.m. to 5 p.m. Admission is free. Free parking and shuttle service to and from the church will be available at the Trident Center Office Building on Purdue Avenue and Olympic Boulevard. All proceeds support the outreach and mission work of the church. Most major credit cards will be accepted.